Erickson's 'Honor Student' was selected for the NEXT ACT! summit in New York. Michael Erickson, professor and playwright in the English Department of the Webster University College of Arts & Scienes, will be in residence in Ashland, Oregon, next week after his play won the Ashland New Plays Festival contest. At the festival, members of the Oregon Shakespeare Festival will direct and perform Oberon Springs, Erickson's full-length play about environmental toxins and human reproduction. He will be in residence Oct. 16-24 for rehearsals and public readings of the play. Another full-length play by Erickson, Honor Student, was selected for the Capital Repertory Theatre's NEXT ACT! 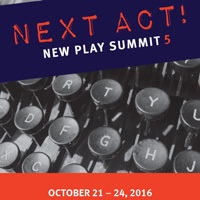 New Play Summit. It is one of four new plays to be presented over the four day summit, Oct. 21-24, in New York. Also in New York, Erickson's one-act play, Caveman's Rock, was named second-place winner of the Fourth Annual Science Playwriting Competition at Stony Brook SUNY. A public reception and performances of the winning plays will take place Nov. 2 at the Simons Center for Geometry and Physics on the Stony Brook campus. And that's not all the attention this year for short plays by Erickson, who teaches playwriting and other topics in the English Department's Creative Writing program. Last Tree Easter Island will be published in "105 Five-Minute Plays" by Smith & Kruase this fall. Another short play, A Denial of Allegations by the Candidate, premiered at the Tesseract Theater last May and was also preformed at the Hollywood Fringe Festival in July.